"It's a small world" is an often-heard expression. The truth of this was recently demonstrated when I received an email from the editor of Double Exposure inquiring if I would be interested in doing an interview with Alan Maltz, a Florida based photographer who is the Official Fine Art Photographer for the State of Florida and the Official Wildlife Photographer of Florida. There was a certain irony to this. Last year we flew to Ft. Lauderdale for the start of a cruise through the Panama Canal back to San Francisco. Due to the uncertainty of on-time air travel these days, we always go a day early and stay the night before embarkation at a hotel close to the cruise ship terminal. As anyone who travels knows, most hotels have some sort of "visitor's guide book" that extols the local virtues. While waiting to meet some friends for dinner, I started perusing the Ft. Lauderdale visitor's guidebook that was in our room. 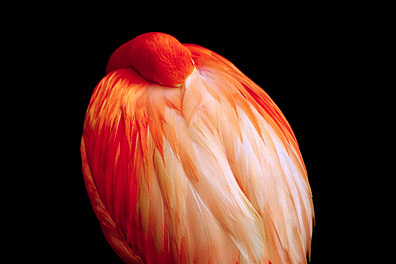 I was immediately awed by a series of images of egrets and flamingos that were shear poetry in light. The photographer was Alan Maltz. I remember thinking, at the time, that I should contact Mr. Maltz to see if I could set up an interview for Double Exposure. In the end, the idea got lost in the rush of events that always seem to be connected with embarkation for a cruise. Naturally, I said that I was most interested in the project. My editor then put me in touch with Katie Leigh, Maltz's publicist and an interview was arranged. Jerry Currier: Alan, thanks for taking the time from your very busy schedule for the readers of Double Exposure. I understand that you are a Brooklyn, New York native with a degree in psychology. That seems quite a stretch from becoming a leading wildlife/landscape photographer, based in Florida. I'd like start off by asking when and how you developed an interest in photography? Alan Maltz: At my college graduation ceremony, from Long Island University, with a degree in psychology, I heard a voice that directed me to pick up a camera. I listened to that voice/message and bought a camera right after the ceremony. The next day I left for Europe, with some friends, and took my first picture a couple of days later in Marseilles, France. This image "Meeting in Marseilles" (http://www.alanmaltz.com/gallery/EchoesInTime/) turned out to be one of my best. At that point, I realized that I had found my calling in life. I never looked back, that was the photography part. With regards to Florida, I lived in Woodstock, New York for a couple of years and during that time, a friend invited me to Miami. I had been there before but never really connected. One day, my friend, his wife and I took a road trip to the Keys to visit a friend of his. When we arrived, I was a deja vu experience. This person's house had an unexplainable effect on me. As it turned out, three months later I wound up purchasing the house and I have been there ever since (32 years). That is the Florida end. Nature and wildlife are my passions. 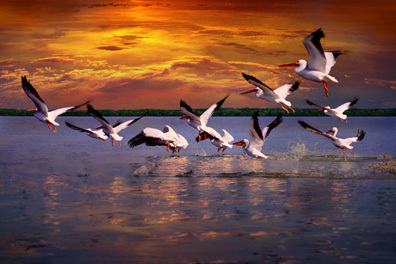 Put all three elements together and you get a passionate nature and wildlife photographer from Florida. JC: What was your first camera? What camera(s) do you use today? AM: My first camera was a Miranda Sensor X. Today I use Nikon F5s and Nikon lenses. JC: I believe that you shoot only film, that you have never shot digital. Why is that? AM: I know film and love film, it works to perfection for me. I am a fine art photographer and I focus more on a painterly look rather then a photographic look. Film enhances my style. If I were to shoot digital, I would have to recreate this feeling digitally. JC: Most film photographers have a preferred film emulsion. With that in mind, what is your favorite film? Can you also tell us why? AM: My film of choice is Fuji Velvia 50. I prefer this film because of the intense color saturation and fine grain. Also, producing some pieces to 12' x 8' presents less of a challenge. JC: What do you mean when you say, " presents less of a challenge?" AM: Because of the high quality of this film with its tight grain structure, enlarging to extreme sizes makes it that more applicable. If I were to produce an image from a film with an ASA of 200, or even 100, the result could be much different. I look at the film as base. From that point, all other aspects of the process have to be top notch including scanning, color correction, retouching, etc. It is like baking a cake, one wrong ingredient can jeopardize the end result. JC: You have a number of books to your credit. 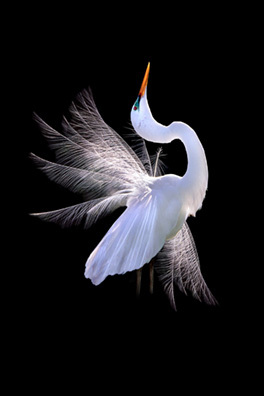 In fact, I understand that you have just put the finishing touches to your latest, "Visions of Beauty - Fort Myers, Sanibel & Beyond." You have stated elsewhere that in your mind's eye you see the subjects of your photographs as paintings. Do you see your books as a realization of this, perhaps as a way of reaching a wider audience for the deep love of nature that is evident in your images? AM: For me, publishing high-end coffee table books is a large part of my success. First, I own the publishing company, so I have total control of the creative result. I believe these books bring an incredible amount of exposure and creditability, my expression to the outside world. They also make excellent portfolios with regards to client image selection, etc. JC: Would you give us some insights into the effort, pit falls and rewards of being involved in the publishing of a major book? AM: I do not see any downside in producing my books. Although each one does take an incredible amount of dedication and time. Average time from concept to completion is approximately 16 months to two years. The books have been very financially rewarding as well as self gratifying and fulfilling. There is nothing more credible than an award winning book. JC: This is sort of a "which came first" question: do you develop the idea of the book and then look for and shoot the images or do images existing in your archives suggest the book's subject? AM: With all four of my major coffee table books, I targeted the areas first, then created the content for each. In some instances, I already had some images of the area. 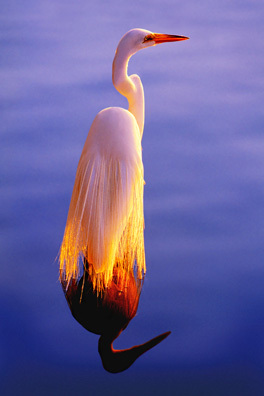 JC: When will your new book, "Visions of Beauty - Fort Myers, Sanibel & Beyond," be available in bookstores? AM: I believe this coming December 2009 or January 2010. JC: You seem to have a real love for Florida? Was this a "love at first sight" sort of thing or is it something that matured with time? 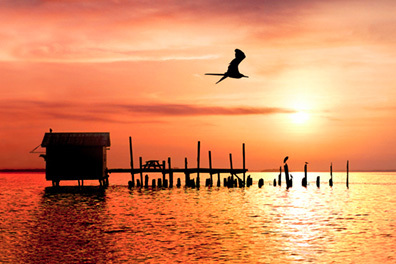 AM: I fell in love with a specific location, which happened to be in Florida, as I explained in a previous question. I look at it as destiny. As I became more familiar with living here, my admiration and love continuously expanded. 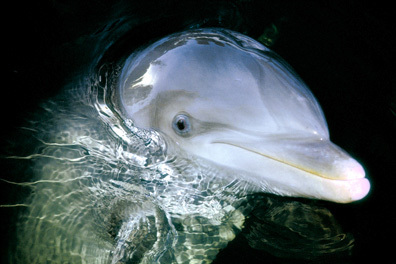 JC: I believe you know another noted Florida based photographer, Clyde Butcher. I had the opportunity to interview Clyde for the December 2008 issue of Double Exposure. I asked him if he had ever had any uncomfortable encounters with the local wildlife. He cited an overly curious alligator that was discouraged by a rap on the nose with a paddle. 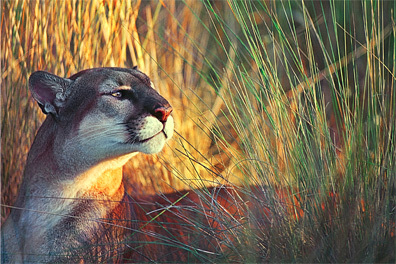 An image on your website , "Majestic Moment," is an outstanding capture of a Florida panther. This made me wonder if you have ever had any "sweaty palm" encounters with the local fauna? AM: The only time my palms get sweaty is when I am in an urban environment before dawn. There are times when I find myself in vulnerable situations (the human element). I never felt any fear in the wild. 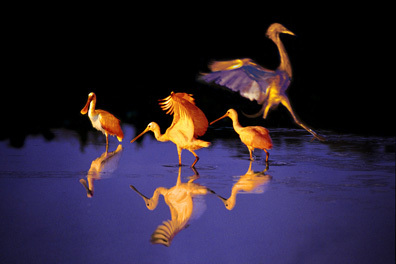 JC: Images of "dancing" egrets were my first experience with your imagery. I was stunned at the feeling of elegant motion you captured in still photographs. I wonder if you can tell our readers how you accomplish this magic? Is it all done in the camera, do you manipulate in the post processing or is it a combination of both? AM: Whatever you see in my work occurred exactly that way. I feel extremely blessed to have a great relationship with the natural world; for me it is magic. JC: How important is the character of light when it comes to making your image decisions? Is there a specific emotion or sensation you are seeking? AM: For me, lighting is everything. The times I shoot are early morning before sunrise until about 8:30am and late afternoon from about 4:00pm into twilight. I look for the sensual, romantic and magical aspects of light. JC: When in the field, do you alter or enhance the existing light with flash or some other light source such as reflectors? Do you use any filters? JC: Much of your work seems to be done as a result of assignments from clients. I assume that most clients have specific results in mind. How does this affect your artistic and creative decisions? AM: Most of my clients give me full creative control. Of course, there are times when I have to follow specific guidelines to accomplish the purpose of the shoot. JC: Once you are "on location" for the shoot, do you let the scene "speak" to you or do you already have a defined vision of what you want to capture? AM: Sometimes the scene presents itself very clearly. Other times it may require lots of thought and some planning to achieve the best results. 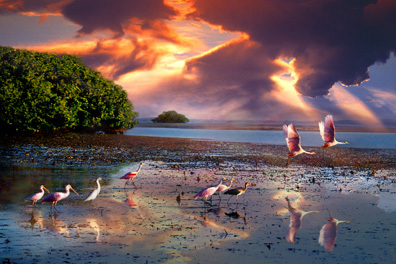 JC: In addition to your wildlife images you create breathtaking landscapes and aerial images. Do you use any special cameras for this work? AM: The only adjustments I make are with aerial photography. The equipment remains the same. I may have to push the film one stop and use ASA 100 instead of 50 to compensate for the movement of the aircraft. JC: What kind of aerial platform do you use, fixed wing, helicopter or...? AM: I use helicopters exclusively. JC: When shooting aerial images are there specific problem areas that have to be taken into account? AM: Yes, I get motion sickness rather easily, especially looking through a lens for long periods of time. JC: Many of the final images you prepare for your clients are very large prints. Can you give us a brief idea of what steps are involved, from camera to the client's walls? JC: Where do you visualize that your photographic quest will take you in the future? AM: I like to take it one day at a time but I already have a concept for my next book. Also, I see my work being utilized more and more in the healthcare industry because of the nature of the work. JC: Along that line, I recently received a press release concerning the opening of Suncoast Hospice's new facility in Palm Harbor, Florida that features over fifty of your large images. Your images were chosen because they convey warmth and tranquility, the perfect atmosphere for the hospice and its mission, according to Pat Lucas, Regional Director of Suncoast Hospice Houses. One last question: Alan, you have been quoted as paraphrasing Theodore Roosevelt, 'walk softly and carry a big lens' to illustrate your wildlife photography philosophy. Is there any other advice you would give to the fledgling wildlife photographer? AM: Proceed with passion, set your alarm clock so you can be on location before sunrise, ready for first light...and do not quit your day job just yet! Alan's website may be viewed here.